Brief Synopsis – A reporter trying to get ahead fabricates a story about a street pimp but gets into trouble when a real pimp claims that the story is about his life. My Take on it – This is a film that I had never heard of beforehand and only came across it during my quest to watch all films that have had a cast member nominated for an Oscar for Best Supporting Actor. The idea presented here is unfortunately quite mediocre and in many instances comes across as being more laughable than poignant in the way things are shown. Christopher Reeve is usually not known for roles that are quite gritty and his casting in this film is very good because it allows for him to show his acting abilities in such a diverse kind of role. Morgan Freeman was nominated for an Oscar for Best Supporting Actor (the first of his career) for his role as a very devious and despicable pimp. This is quite perplexing to me because he doesn’t really stand out so much in this role. The one things that works really well here is the way that they present how the media started to try and get stories that show life on the street even in gritty neighborhoods. The storyline is pretty gritty but the way that things are presented here doesn’t work well enough to make the viewer really care about anything that happens. Bottom Line – Pretty mediocre idea that is more laughable than poignant. Reeve is good here because it’s a very different kind of role than he was usually cast in. The fact that Freeman was nominated for his first Oscar for his role as the pimp, is quite perplexing to me since he doesn’t really stand out enough in the role. The storyline is quite gritty but things just don’t really work as well as one would hope that they could. Absolutely disagree with you here on your assessment of Morgan Freeman. When I think of this film – HE is what I remember. 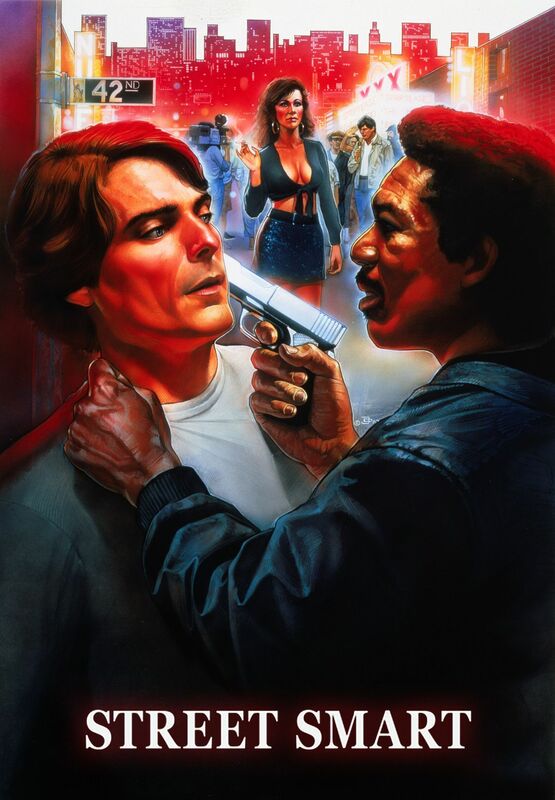 Not sure if he had done Brubaker first – in a one scene role with Robert Redford as a crazy convict who had taken a 2nd con captive – but in Street Smart – as Fast Black, the pimp, he took what could have been a cliched role and hit it out of the park. I thought his Oscar nomination was well deserved. Reeve was solid in his role – but IMO – did nothing particularly stand out with it. Kind of by the book. I’m not sure I’ve seen the movie since it came out (on a big screen) – but I do recall it leaving an impression on me – specifically Mr. Freeman.